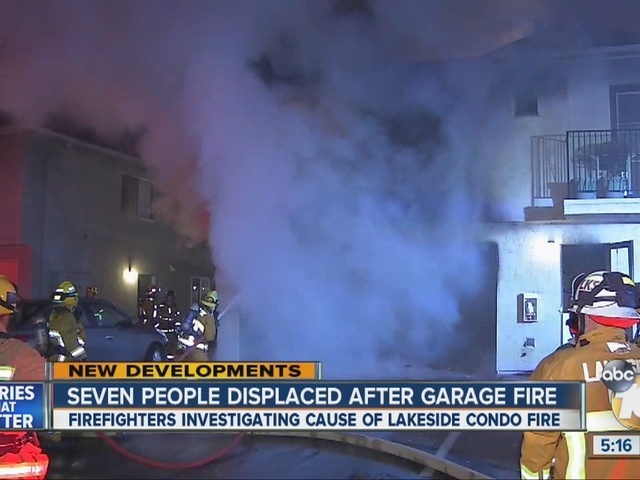 Seven people are without a home after a garage fire caused major damage to a condominium complex in Lakeside. The fire broke out just after 2 a.m. Sunday in the 12000 block of Lemon Crest Drive. When crews arrived, they found smoke billowing from the condo and worked quickly to put it out. “Everything was on fire, flames we couldn't get in here at all,” Marivel Chagolla said. Chagolla wasn't home at the time, but her daughter and two friends were upstairs asleep when the fire started. One of them almost got trapped inside the burning condo and had to jump out of the second-story window. “My other friend was on the floor choking for air and spiting everywhere and she ran downstairs and I was stuck upstairs and I jumped out the window,” Rita Lopez Moreno said. Fourteen people in four units had to evacuate. Only two condos were damaged. “I was in shock, I was like ‘oh my goodness our homes are going to be destroyed’ so I was like ‘call 911,” Ramona Garcia said. “I lost everything, all my pictures from babies and everything on fire, we had them in our storage,” Chagolla said. Chagolla says although she's lost everything at the home she's lived in for 11 years, she's grateful her daughter and friends made it out alive. “Now we don't have a house for the holidays, but we're safe,” Chagolla said. The family suspects the fire was started intentionally and thinks they know who did it. Firefighters have not said if it's arson.